Recently Environment Southland issued a warning about eating shellfish near Whalers Bay in the New River Estuary. Warnings like this are becoming increasingly common around New Zealand as rivers spew sediment, nitrogen and phosphorous into our lagoons, lakes, estuaries and out of our river mouths. "...some of the most important of coastal and marine habitat because they provide rich feeding grounds for shore birds and breeding grounds for fish and other marine life. They also tend to be important sites of human habitation. Almost all New Zealand’s main cities are on estuaries, from Whangarei in the north to Invercargill in the south. Their estuaries are subject to numerous sources of ecological damage, including weed infestations, the impacts of domestic animals on wildlife, stormwater outflows, and in some cases the overland travel of industrial chemicals (e.g. lead, cadmium, zinc) from sources such as paved roads, industrial sites, shopping mall parking lots and so on. Even where communities have secondary or tertiary treatment of their sewage, some of the chemicals that enter sewage, such as birth control hormones, are not extracted by treatment processes and end up in the harbor." 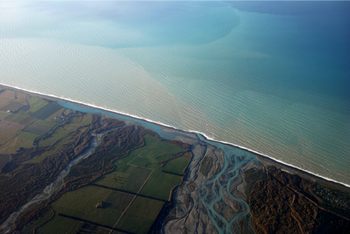 Two estuaries in Southland fit the University's description well, the New River Estuary beside Invercargill and the Jacobs River Estuary adjacent to Riverton. Both are also affected by rivers that flow into them after having travelled through intensively farmed land. The 2010/2011 reports on their health through macroalgal monitoring revealed some real concerns. In the case of the Jacobs River estuary, over 60% was assessed as poor to very poor and the New River Estuary had around 30% as poor to very poor. "We need, however, to know when more science is not needed. A call for more science to be done can sometimes be a way of delaying difficult decisions. There is, for example, no need for more scientific data or modelling to establish the link between the land use change that has taken place in the Waituna catchment in Southland and the dire state of the Waituna Lagoon; there simply is no other explanation. Scientists themselves are not always the best people to advise when more science is required – their basic motivation quite rightly is to continue to explore and gather new data. While science is necessary for policy, it is not sufficient. Science does not tell us how to make trade-offs, and trade-offs will almost certainly be needed. It is very unlikely that we can have our cake and eat it too. Even if technical fixes were to become available for dealing with all our water quality problems, they would still cost a great deal of money. As the writing of this report draws to a close, I am aware that my own knowledge of the science of water quality has increased hugely since my presentation to Members of Parliament in 2010. There is no end to the complexity, but the state of our rivers, lakes, wetlands, estuaries, and aquifers is of great importance to this clean green country of ours. Increasing our understanding is a worthwhile investment and will pay dividends for our children and grandchildren." Dead Zones of the worlds seas due to farm run-off. Yes, New Zealand is on there. As for the ability of this government to think of later generations - they either can't or won't. They will continue to exploit the environment as long as it gets them and their mates more money as that's the only thing that they can see and give thought to. Quite right, Draco, hence the stopping of the 5 yearly Environmental Report, the less we know about the environment the more it can be exploited for short term profit.